Town Throws Pride Parade For Its Only Gay Resident? Paul, a 33-year-old hardware store owner was too shy to ask for a parade, but that didn’t stop almost 2,000 residents from showing their support for his homosexuality. Apparently Paul was so modest that he practically had to be dragged out of his house and into the pink limo that took him to the parade where the whole town was ready to support him.” So good! The Onion News Network, A tomahawk of honesty in the skull of lies, has the story. The story, if you haven’t gathered by now, is a hilarious spoof. We’ll take it anyway! 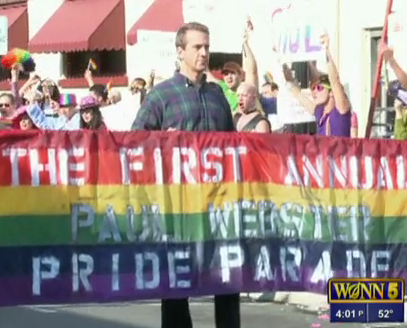 What do you think of Pennington’s Paul Webster Pride Parade?